Indian Spiritual tradition has propounded four Purusharth (objectives) of a human life. These being Dharm (Righteousness), Arth (Material Pursuits), Kaam (Contentment) and Moksh (Enlightenment). 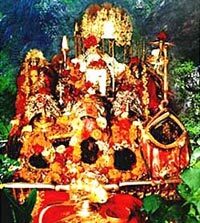 Shri Mata Vaishno Devi is believed to grant all the four boons to those who visit Her Holy Shrine. She is considered to fulfill anything and everything that a person wishes for in life, in a righteous way. It is an experience of all, that no one goes empty handed from Her Great Pilgrimage. Destination : Jammu - Katra. Upon arrival at Jammu meet by our representative and proceed towards Katra (50kms/1hr drive). Arrival at Katra and check in to the hotel. After a short break, trek to Mata Vaishno Devi shrine (12 kms), ponies can also be arranged by self for the trek. Mata Vaishno Devi temple is one of the holiest Hindu temples dedicated to Shakti and is the second most visited religious shrine in India after Tirupati Balaji Temple. Visit the Mata Vaishnodevi Shrine and return to the hotel in the late evening/night. Dinner and overnight stay at hotel in Katra. In the morning after early breakfast, start the trekking towards Mata Vaishno Devi Shrine (12kms). One can also arrange ponies from the starting point by himself / herself for the trek. After visiting the Mata Vaishnodevi Shrine, return to Katra late in evening/night. Dinner and overnight stay at Katra. Mata Vaishno Devi temple is one of the holiest Hindu temples dedicated to Shakti and is the second most visited religious shrine in India after Tirupati Balaji Temple. After breakfast check out from the hotel and transfer you to Jammu (50kms/1 hr). Upon arrival at Jammu, directly go for local sightseeing tour including Raubireshwar temple, Bahu fort and gardens, Mahamaya temple, Gauri Kund, Mansar Lake and famous Raghunath temple. Later proceed to Jammu railway station/airport to board the train / flight to onward destinations. Transportation and Sightseeing in Non Ac Tavera as per the itinerary below inclusive of all transportation related charges. Accommodation in Deluxe Hotels on Twin Sharing Basis.